The faint trail across the lower part of this picture by Simon Allcock is the International Space Station and the Space Shuttle Atlantis passing over Derby at 17:37 on the 26th November 2009. 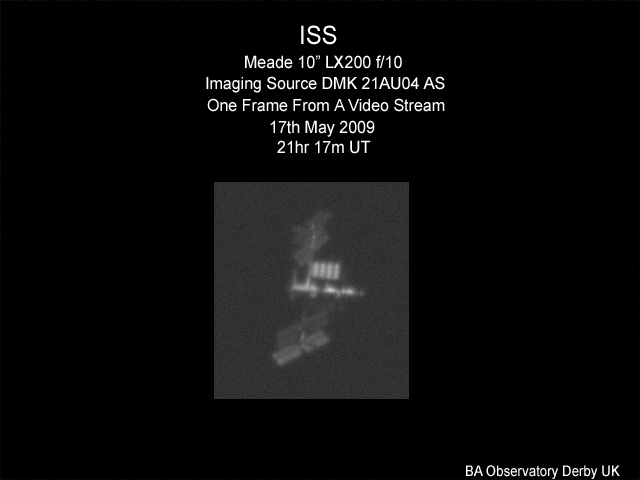 Simon comments: "At the time when I took the picture Atlantis had undocked from the station and with the naked eye you could see the ISS closely followed by Atlantis. It was an awesome sight! 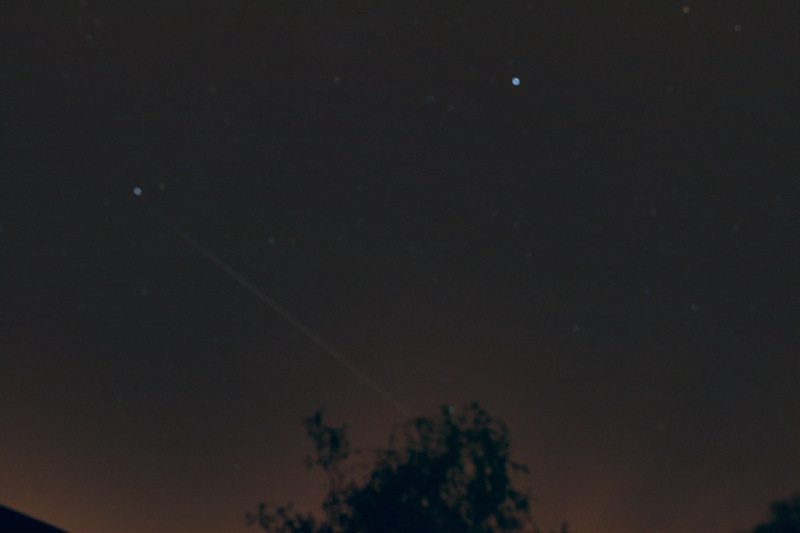 As they were on the same orbit it just shows one trail. I had to mount my Canon EOS 400D on my tripod as the ISS and Atlantis only reached a maximum altitude of 13 degrees (my observatory walls were too high to piggy back on my LX90! ), which was when they were closest to Earth. They travelled in the direction west-south-west to south and were of magnitude 0.0. The exposure time was 148 seconds at F6.3, ISO 400. When I looked at the image I could not see anything but sodium light and half Moon light pollution! I opened the image in CS2, magnified and cropped the area where I thought the ISS/shuttle should be, did two Grad X passes over the image and hey presto there they were!" The bright 'star trail' near the top of the image is Jupiter. Simon Allcock captured this image of the International Space Station and Space Shuttle Atlantis passing across the sky from Derby at 18:31 UT on the 20th November 2009. He used a Canon EOS 400D camera at f6.3, ISO 400, and an exposure time of 68 seconds. The ISS and Atlantis were orbiting west to south-west, and reached a maximum altitude of 35 degrees. The closest they came to Earth was 570 km and they had a magnitude of -1.9. The trail ends near the star Altair and the star Vega appears near the top of the image. Space Shuttle Atlantis, on mission STS 129, was commanded by Charlie Hobaugh, and was on a 12 day mission delivering 27,250 pounds of parts to the Space Station, including a spare gyroscope. The mission also featured three space walks. 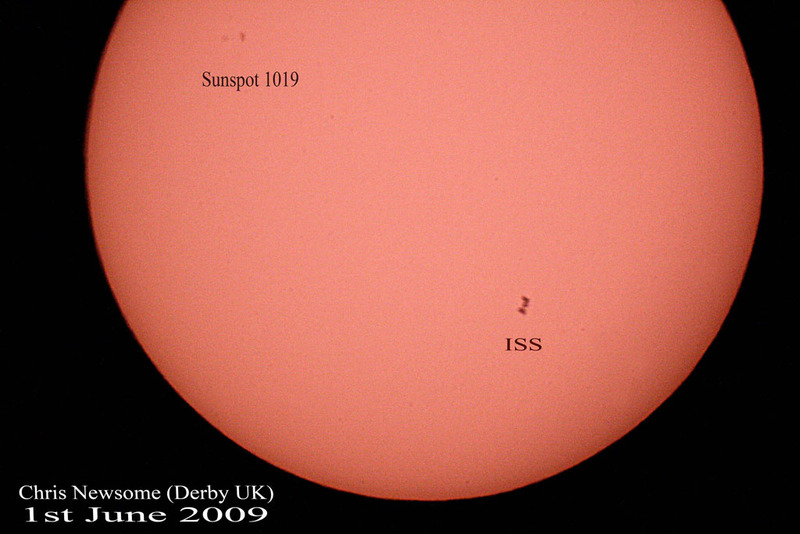 Barry Ashforth captured this incredible image of the International Space Station (ISS) from Derby during it's pass on the evening of the 17th May 2009.